Now you don't have to choose between chocolate chip cookies and cheesecake. 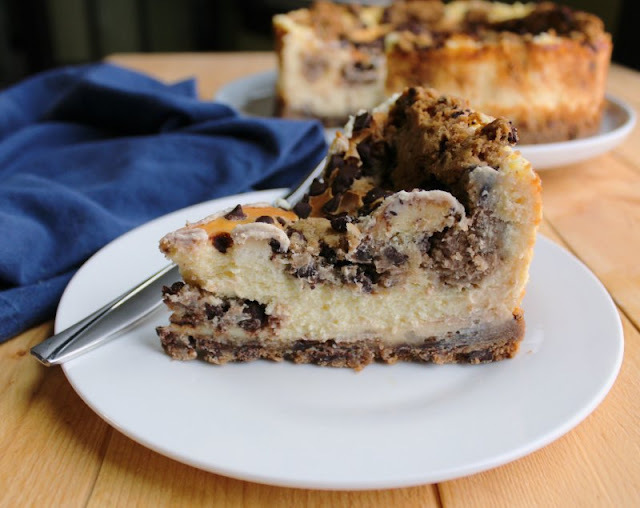 You can have them both at once with this decadent chocolate chip cookie dough cheesecake! If you have a sweet tooth like I do, you are going to love the beauty. 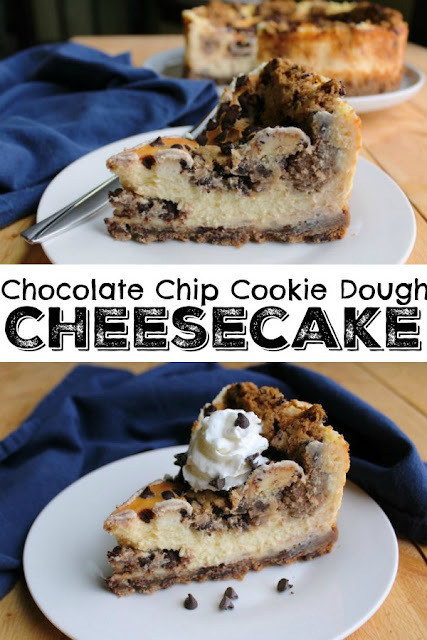 It is loaded to the gills with chocolate chip cookie dough and the cheesecake texture is just right. Plus it is pretty simple to make too! Get your springform pan ready, this is going to be good! MiMi originally made this cheesecake for the blog back in 2016. She shared the way she used to make it with either a graham cracker crumb crust or by baking some chocolate chip cookies and turning them into a crumb crust. She also used a recipe that included sour cream, cream cheese, sugar and eggs. It was delicious and a recipe that I request quite frequently during my high school years. But I decided to revisit the recipe and switch it up a bit. Instead of a crumb crust, I gave it a chocolate chip cookie crust. I also changed the cheesecake batter itself. I used Donna's famous cheesecake recipe as a base instead. These changes both made the cheesecake a little easier to make and the results were delicious. I will warn you that you are going to need a 10" springform pan for this recipe. Anything smaller and you are going to have a mess on the bottom of your oven. I suppose you might be able to get away with adding less cookie dough to the cheesecake and try it in a 9" pan, but I say just go for it and use the bigger one! That way you cut your risk without cutting your reward! Boy oh boy did that fettuccine alfredo recipe bring back memories. 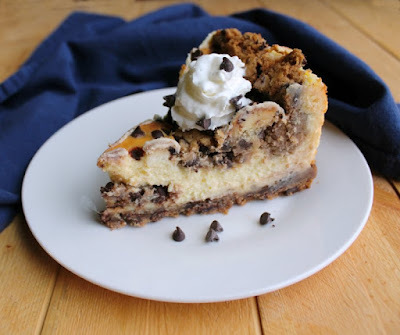 The subject of the special chocolate chip cookie dough cheesecake recipe came up. For special dinners, Carlee often requested that I make the alfredo, a salad with Aunt Ellen's Garlic Parmesan Dressing and this cheesecake. Her friends enjoyed this before several formal dances too. Evidently it has been a while since I last made it. My piles of recipes have all been gone through and organized. I have 2 full recipe boxes that have been completely emptied and searched through. Still, I could not find THE recipe. I vaguely remembered it was an Olive Garden copycat but wasn't sure. Carlee, who was oblivious to the torment I was going through, emailed me the link to a recipe she thought may be it. She was wanting me to make it again too. I just can't surprise that girl. Would you believe that after I gave up I went downstairs to my file cabinet to get some labels and found several file folders of old recipes? I bet you could guess what I found in the last one! Luckily I found some others that I can't wait to share as well. For crust: Generously grease the bottom and sides of a 10 inch spring form pan. Combine the butter and cookie crumbs. Press onto the bottom and sides of the pan. For filling: use and electric mixer on high-speed to combine the cream cheese, sugar, eggs and flour. Beat until smooth. Add the vanilla and sour cream and mix just until blended. Pour half of the batter into the prepared crust. Scoop one pound of the cookie dough and form into golf ball size pieces. Drop those into the batter. Sprinkle with chocolate chips. Pour remaining batter over that. Bake for 60 minutes. Turn off the oven and leave the cake in the oven for 30 more minutes. Let cool to room temperature then cover and refrigerate until ready to serve. To serve, remove the sides of the pan and cut into pieces. Make sure your ingredients are at room temperature before you start. Cold cream cheese or eggs greatly increase your risk of having clumps of cream cheese in your batter. Make sure to whip the cream cheese until it is super smooth before you add anything else. This is your best chance to get out any lumps. Be sure to scrape the sides of the bowl and the paddle multiple times as you go. Drizzle in the sweetened condensed milk slowly and be sure it is mixed in well before you add more liquid. Once you add the eggs, beat only until combined. You don't want to whip in too much air. That increases your chances of cracks and bubbles. Press half of the cookie dough into the bottom of a 10" springform pan to form a crust. In your mixer bowl, beat the cream cheese until it is smooth and creamy. Be sure to scrape the sides and bottom of the bowl and the beater along the way to avoid lumps. With the mixer running, slowly drizzle in the sweetened condensed milk. Beat until creamy. Stir in the vanilla and the eggs, one at a time. Mix until combined, but don't whip in too much air. Pour over cookie dough crust. 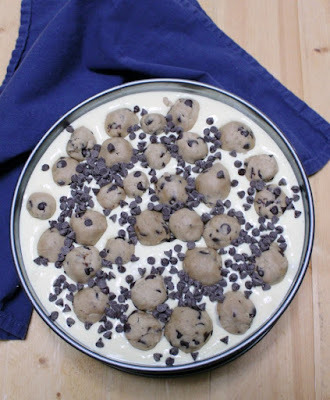 Make small balls out of the remaining cookie dough and place sporadically over the top of the cheesecake batter. Sprinkle with chocolate chips. Bake until the center is just shy of set, about an hour to an hour and ten minutes. Turn off the oven, but leave the cheesecake in the oven with the door shut for 30 more minutes. Remove cheesecake from oven and allow to come to room temperature, then move to the refrigerator to chill for at least a couple of hours. Well, I'll just plan on making this for my family this weekend!!! Oh my cookie dough and cheesecake heaven!! Yum!! I hope you all love it! I wish I had a tally for how many years in a row this was my birthday dessert. It had been a while since we made it, so it was a lot of fun to have it again! Wow Carlee this looks and sounds so good! Thanks for sharing your awesome recipes with us at Cooking & Crafting with J&J. Thanks, Julie! I always love partying with you gals! Mmmm... This sounds so good! Thanks for sharing, Mimi! She has always made delicious desserts, it was fun to have her dig this one out of the vault! Ha! If I waited until then, I could never have it ;-) Thanks, Rue! Wow, Carlee, what genius is this??! I think I might have been missing out all these years!! Happy Throwback Thursday!! I know, right? 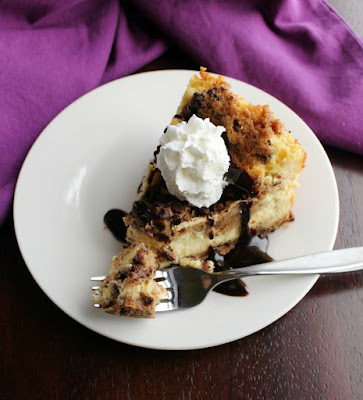 Two of my favorite indulgences mashed into one decadent dessert! So basically my 2 favorite desserts in one! I need to make this right away! Mine too! I can't believe we somehow went a few years without making one. It won't happen again! Swoon! Cookie dough and cheesecake! Oh my! I want this now. Thanks for sharing on the Creative K. Kids Tasty Tuesdays Linky Party. I hope you will join us again next week. I know, right?! Two of my favorite guilty pleasures married into one bite! Me too, two of my favorites combined! Thank you! Thanks so much for sharing your post with Full Plate Thursday and have a great day! Wow, this sounds amazing! I would love to try it! Thanks so much for sharing at Inspiration Thursday!